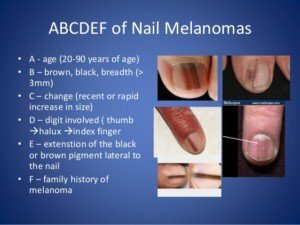 What Cancer Other than Melanoma Can Affect a Nail? Subungual melanoma is a cancer affecting a fingernail or toenail and often has a poor prognosis. However, melanoma isn’t the only cancer that can affect a nail. “Squamous cell carcinoma of the nail apparatus is a rare malignant tumor that usually originates underneath the nail plate and grows slowly with possible bone invasion,” says Hadley King, MD, a board certified dermatologist who specializes in medical and cosmetic dermatology. It shouldn’t surprise you that the other cancer that can involve the nails is squamous cell carcinoma, if you already know that SCC can arise just about anywhere on, as well as inside, the body. Chronic paronychia. 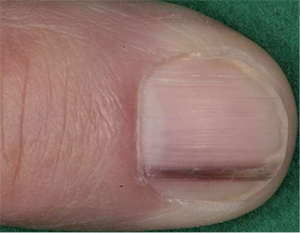 An inflammatory reaction of the nail fold at the cuticle to irritants and allergens. The tipoff that this isn’t a nail cancer is that usually, all the fingertips are involved, since the cause is irritants and allergens. Onychomycosis. This is a fungal infection that can affect any nail, but mostly the toenails. It prevents as a yellowish discoloration and thickening of the nail, plus separation of the nail from the nail bed. It usually affects multiple nails. Pyogenic granuloma. This harmless (though unsightly) vascular lesion presents as a dark or reddish nodule or blob on the skin. It can grow halfway on a nail and halfway on the skin. Subungual wart. This may seem like a totally harmless condition since it’s seemingly a mere wart. But this type of wart, growing under the nail, not only can be very painful, but it can actually progress to squamous cell carcinoma. This transformation is rare. There are several other non-cancerous conditions that nail SCC can mimic. It’s well-known in the dermatology field that subungual squamous cell carcinoma presents a challenge for proper diagnosis. Unlike melanoma of the nail, subungual SCC can lead to pain, swelling and inflammation as it progresses – but usually it produces only mild symptoms. If the treatment is delayed long enough (due to misdiagnosis or patient neglect), this cancer can become quite unsightly. 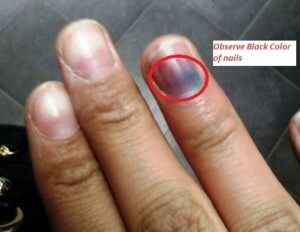 And also unlike melanoma, this nail plate cancer rarely (though not impossibly) spreads to other parts of the body. Who gets this nail cancer? 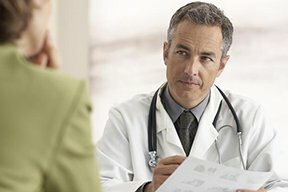 It can occur during any adult age, but the typical patient is a man between 50 and 69. The male to female ratio is 2:1. Nicknamed the “great mimicker nail tumor,” its cause isn’t definitively known, but it’s associated with trauma, chronic sun exposure, radiation, burning, tobacco and a compromised immune system. It’s very rare, but it’s actually more common than nail melanoma. If you suspect you have this “other” cancer of a fingernail or toenail, there is no reason to lose sleep. It’s extremely unlikely a person can die from this, even with a delayed diagnosis. However, if bone destruction is involved, partial digit amputation may be required. It should also be noted that it’s possible for a nail melanoma (the rare amelanotic kind) to mimic a squamous cell carcinoma. Is There a Such Thing As Nail Cancer? 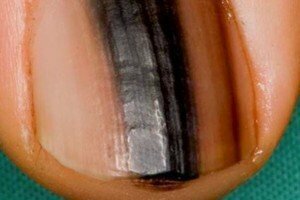 Can Melanoma in a Nail Be Green?